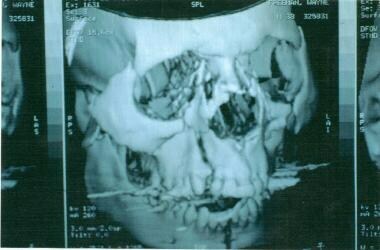 Maxillofacial injuries are commonly encountered in the practice of emergency medicine. More than 50% of patients with these injuries have multisystem trauma that requires coordinated management between emergency physicians and surgical specialists in oral and maxillofacial surgery, otolaryngology, plastic surgery, ophthalmology, and trauma surgery. [1, 2, 3] . Nalliah et al, using the Nationwide Inpatient Sample of 39.88 million total admissions in the United States, estimated a total of 21,244 hospitalizations that underwent a facial fracture reduction as the primary procedure  . The total hospitalization charges were about $1.06 billion, and total hospitalization days was 93,808  . Trauma to the maxillofacial region mandates special attention. Important sensory systems are contained within the face (e.g. vision, auditory, somatic sensation, gustatory, olfaction and vestibular). Also, vital structures in the head and neck region are intimately associated (airway, blood vessels, nerves and gastrointestinal tracts). Lastly, the psychological impact of disfigurement can be devastating. The face is divided into equal thirds. The upper face, from the hairline to the glabella. Fractures in this region involve the frontal bone and frontal sinus. The midface, from the glabella to the base of the columella. Fractures is this region involve the maxilla, nasal bones, nasoethmoidal complex (NOE), zygomaticomaxillary complex (ZMC), and orbital floor. The lower face, from the base of the columella to the soft tissue menton. The lower third is subdivided in an upper third from the columella base to the lip commissure and two lower thirds from the lower lip to menton. Fractures in this region involve the dentoalveolar segments and the mandible. In developing countries, motor vehicle accident (MVA) is the most common cause of jaw fracture, whereas, in developed countries, assault is the most common cause and MVA is the second most common  . The review by Nalliah et al using the Nationwide Inpatient Sample found assault as the leading cause for hospitalization for reduction in facial fractures in the United States (36.5%), followed by MVA (16%), falls (15%), and other transportation accidents (3.5%)  . The kinetic energy present in a moving object is a function of the mass multiplied by the square of its velocity. The dispersion of this kinetic energy during deceleration produces the force that results in injury. High-impact and low-impact forces are defined as greater or lesser than 50 times the force of gravity. These parameters impact on the resultant injury because the amount of force required to cause damage to facial bones differs regionally. The supraorbital rim, the maxilla and the mandible (symphysis and angle), and frontal bones require a high-impact force to be damaged. A low-impact force is all that is required to damage the zygoma and nasal bone. The face is made up of vertical and horizontal buttresses where bone is thicker to neutralize forces applied to it. Reduction and fixation of these key areas are the basis of maxillofacial reconstruction  . Frontal bone fractures: usually result from a high velocity blunt trauma to the forehead (e.g. MVA). The anterior and/or posterior table of the frontal sinus may be involved. More than one-third of patients with frontal sinus fractures are likely to have concomitant intracranial injury  . Orbital floor fractures: Injury to the orbital floor can result in an isolated fracture or can be accompanied by a medial wall fracture. There are three recognized theories regarding mechanism of injury; globe-to-wall theory, hydraulic theory and bone conduction theory. Most injuries are associated with traumatic injury through interpersonal violence, sport or road-traffic collision  . Nasal fractures: Because of the prominence of the nose and its central location on the face, nasal fractures are the most common facial fracture  . Nasoethmoidal fractures (NOE): As the incidence of high-speed, high-force accidents has increased over the decades, so too has the number of such fractures. Due to the degree of force and the vectors involved, NOE fractures rarely occur as isolated events. Associated injures often include central nervous system injury, cribriform plate fracture, cerebrospinal fluid rhinorrhea, and fractures of the frontal bone, orbital floor, and middle third of the face, as well as injury to the lacrimal system  . Zygomaticomaxillary complex fractures (ZMC): These fractures result from direct trauma. Fracture lines extend through zygomaticotemporal, zygomaticofrontal, and zygomaticomaxillary sutures and the articulation with the greater wing of the sphenoid bone. The majority of these fractures result from trauma inflicted in altercations followed by MVA  . Maxillary fractures: These are classified as Le Fort I, II, or III  . LeFort I fracture is a horizontal maxillary fracture across the inferior aspect of the maxilla and separates the alveolar process containing the maxillary teeth and hard palate from the rest of the maxilla. The fracture extends through the lower third of the septum and includes the medial and lateral maxillary sinus walls extending into the palatine bones and pterygoid plates. LeFort II fracture is a pyramidal fracture starting at the nasal bone and extending through the ethmoid and lacrimal bones; downward through the zygomaticomaxillary suture; continuing posteriorly and laterally through the maxilla, below the zygoma; and into the pterygoid plates. LeFort III fracture or craniofacial disjunction is a separation of all of the facial bones from the cranial base with simultaneous fracture of the zygoma, maxilla, and nasal bones. The fracture line extends posterolaterally through ethmoid bones, orbits, and pterygomaxillary suture into the sphenopalatine fossa. See the image below. LeFort fractures of the maxilla. Mandibular fractures: These can occur in multiple locations secondary to the U-shape of the jaw and the weak condylar neck. Fractures occur secondary to direct or indirect facial injury, including motor vehicle accidents, falls, sports, and assaults with blunt weapons or guns. Close to half of all patients with maxillofacial injuries have concomitant mandibular fractures  . Alveolar fractures: These can occur in isolation from a direct low-energy force or can result from extension of the fracture line through the alveolar portion of the maxilla or mandible  . Panfacial fractures: These usually are secondary to a high-energy mechanism resulting in injury to the upper face, midface, and lower face  . These fractures must be composed of at least 3 of the possible 4 facial units in order to be labeled panfacial. See the image below. Presentation includes disruption or crepitus of the supraorbital rims, subcutaneous emphysema, and paresthesia of the supraorbital and supratrochlear nerves. In the conscious patient, facial pain is a common symptom. Lacerations, contusions, or hematoma to the forehead should make the surgeon suspect frontal sinus injury. Visible depression of the forehead is also an important sign. However, this can be easily missed in the acute presentation due to the accompanying soft tissue edema. Cerebrospinal fluid (CSF) leak can present in as many as 19% of the patients with posterior table involvement  . A halo sign or B2-transferrin analysis can be useful to confirm leakage. Frontal bone fracture. Courtesy of Arthur K. Adamo, DDS. A 20-year-old man was assaulted with a lead pipe and received a blow to the forehead. The CT scan shows the fracture and fluid in the sinus. Periorbital edema, crepitus, ecchymosis, enophthalmos, and ocular injury can be present. Infraorbital nerve damage can cause paresthesia or anesthesia of the lateral side of the nose, upper lip, and maxillary gingiva on the affected side. Lateral and upward gaze dysfunction may occur secondary to entrapment of the medial and inferior rectus muscles. Diplopia may be demonstrated on upward gaze due to entrapment of the inferior rectus muscle. If true entrapment is encountered, emergent surgical intervention is indicated, especially in children, to prevent atrophy of the inferior rectus muscle  . Thorough ocular exam by an ophthalmologist is essential to rule out ocular injury. 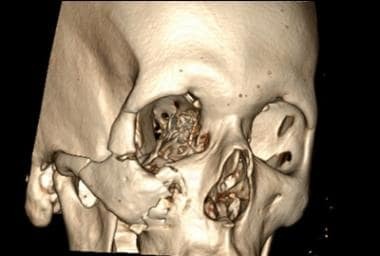 CT scan depicts a "tear-drop" sign that is indicative of an orbital floor fracture. The diagnosis of nasal bone fracture is usually based on clinical examination. Many patients have a displaced nasal bridge or septum from a prior untreated injury. Therefore, confirmation with the patient on the shape and position of their nose is oftentimes helpful. CT scan is helpful but can be misleading, as many old nasal fractures never show ossification of the fragments giving a false impression of a new fracture. The nose is usually edematous and tender. Displacement, crepitus, and epistaxis may also be present. 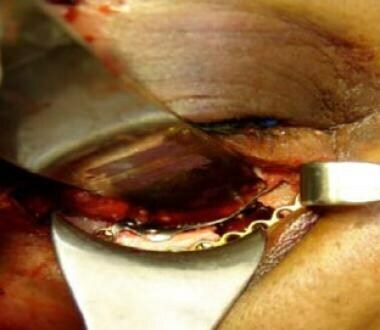 Inspecting the septum with a nasal speculum is mandatory to rule out septal hematoma. This is critical in children. Severely displaced NOE fractures can demonstrate telecanthus (increased distance between the medial canthi of the eyelids), epistaxis, cerebrospinal fluid rhinorrhea, and epiphora (ie, tears spilling over the lid) secondary to blockage of the nasolacrimal duct. In patients with severe facial edema, the position of the medial canthal ligament can appear asymmetric. A traction test to the medial canthus while palpating the nasal bridge can be helpful in differentiating fracture of the NOE from nasal bridge edema. 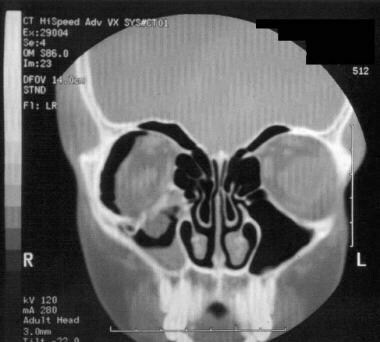 Fracture of the arch of the zygoma may exhibit a palpable defect over the area involved. Pain upon palpation and limitation of movement of the mandible resulting from interference with movement of the coronoid process of the mandible may be found upon physical examination. Clinical findings of ZMC fractures may include a depressed malar eminence, resulting in flattening of the cheekbone and pain upon palpation of the zygomatic eminence. The "flame sign" may be present due to disruption and depression of the lateral canthal tendon. 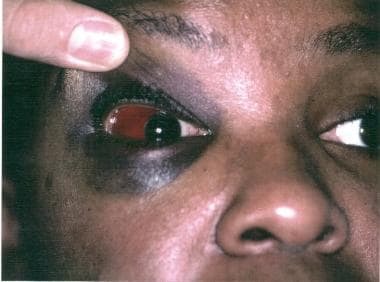 Evidence of a lateral subconjunctival hemorrhage is present. A step defect is often palpated along the lateral orbital, infraorbital rim, or zygomaticomaxillary buttress. See the images below. Zygomaticomaxillary complex (ZMC) fracture. Courtesy of Arthur K. Adamo, DDS. Paresthesia of the lateral side of the nose and upper lip may be present due to impingement of the infraorbital nerve. Diplopia may be demonstrated on upward gaze due to entrapment of the inferior rectus muscle. Trismus may occur because of a depressed zygomatic arch impinging on the coronoid process of the mandible thereby preventing the patient from opening their mouth or more commonly due to concurrent injury to the temporalis muscle. Intraoral ecchymosis or gingival disruption is possible. Potential findings of LeFort I fracture include facial edema and mobility of the hard palate and maxillary alveolus and teeth. Clinical presentations of LeFort II fractures include facial edema, telecanthus, subconjunctival hemorrhage, mobility of the maxilla at the nasofrontal suture, epistaxis, and possible CSF rhinorrhea. 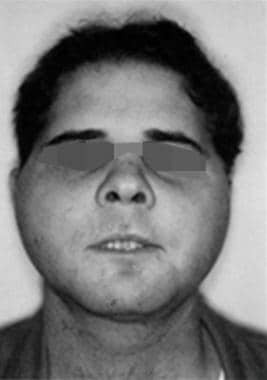 Characteristic findings of LeFort III fractures include massive edema with facial rounding, elongation, and flattening. An anterior open bite may be present due to posterior and inferior displacement of the midfacial skeleton. Movement of all facial bones in relation to the cranial base with manipulation of the teeth and hard palate, epistaxis, and CSF rhinorrhea may also be found upon physical examination. An anterior open bite results from the posterior and inferior displacement of the facial bones that occur in patients who sustain Le Fort III maxillary fractures. Clinical findings include gingival bleeding, mobility of the alveolus, and loose or avulsed teeth. Condyle fractures are the most often overlooked. The area anterior to the meatus of the ear will be tender to palpation. The condyle on the fractured side will not move when the mandible is opened and closed. Common findings of mandibular fractures include painful jaw movement and malocclusion of the teeth and an inability to open the mouth or bite down hard. Mobility and crepitus can be palpated along the symphysis, angles, or body. Intraoral edema, ecchymosis, gingival bleeding, or tears may be present. An anterior open bite can occur with bilateral condylar or angle fractures. Disruption of the inferior alveolar nerve, including the mental branch, may cause paresthesia or anesthesia of half of the lower lip, chin, teeth and gingiva when the fracture involves the mandibular angle, body, or parasymphysis. Mandibular fracture, occlusal radiograph. Courtesy of Arthur K. Adamo, DDS. Mandibular fracture. Courtesy of Arthur K. Adamo, DDS. Did the patient lose consciousness or experience a change in mental status? If so, for how long? Are visual disturbances, flashes of light, photophobia, diplopia, blurry vision, pain, or change in vision present with eye movement? Is any change in hearing present? Is the patient experiencing tinnitus or vertigo? Does the patient have any trouble breathing through the nose? Does the patient have any bloody or clear-fluid discharge from the nose or ears? Is the patient having difficulty opening or closing the mouth? Is pain or muscle spasm present? Is the patient able to bite down without pain, and does the patient feel like the teeth come together normally? Are areas of numbness or tingling present on the face? Inspect the face for asymmetry. Check cheekbones by looking down from the head of the bed (ie, bird's-eye view). The width of the nasal bridge should be half of the interpupillary distance. Inspect the head and the face for abrasions, swelling, ecchymosis, missing tissue, lacerations, and hemorrhage. Inspect open wounds for foreign bodies. Inspect the teeth for mobility, fracture, or malocclusion. If teeth are avulsed, rule out aspiration. Palpate for bony injury, crepitus, and step-off, especially in the areas of the supraorbital and infraorbital rims, frontal bone, zygomatic arches, and at the articulation of the zygoma with the frontal, temporal, and maxillary bones. Inspect the eyes for the presence of exophthalmos or enophthalmos; fat protruding from the globe; visual acuity, abnormality of ocular movements; interpupillary distance; and pupillary size, shape, and reactivity to light, both direct and consensual. Watch for superior orbital fissure syndrome, ophthalmoplegia, ptosis of the upper lid, proptosis, and a fixed dilated pupil. Watch for orbital apex syndrome, blindness, decreased visual acuity, and symptoms of superior orbital fissure syndrome. Evert eyelids and check for foreign bodies or lacerations. Examine the anterior chamber for the presence of blood, flaring on slit-lamp examination, or hyphema (ie, blood layering in the inferior aspect of the anterior chamber). Check the cornea. Use fluorescein staining to distinguish between an abrasion (ie, uptake of dye) and laceration (ie, streaming of fluid in dye). Perform a forced duction test. Anesthetize the sclera, grab the inferior aspect with forceps, and tug upwards. The eye remains fixed if muscular entrapment is present. Palpate the medial orbital area. Tenderness may signify damage to the nasoethmoidal complex. Perform a bimanual nasal palpation test. Anesthetize and press intranasally against medial orbital rim. Simultaneously press the medial canthus. If the bone moves, the nasoethmoidal complex is fractured. Assess the status of the medial canthus ligament and its attachment to the frontal process of the maxilla. Perform the traction test. Grasp the edge of the lower eyelid, and pull against its medial attachment. If an obvious "give" of the tendon occurs, suspect a disruption of the medial canthus. Inspect the nose for telecanthus (ie, widening and flattening of the nasal bridge) or dislocation. Palpate for tenderness and crepitus. Inspect the nasal septum for a hematoma; bluish bulging mass; widening mucosal laceration, fracture, or dislocation; and cerebrospinal fluid rhinorrhea. Inspect for ear canal lacerations, cerebrospinal fluid leaks, integrity of the tympanic membrane, hemotympanum, perforation, or mastoid area ecchymosis (i.e., Battle sign). Inspect the tongue and look for intraoral lacerations, ecchymosis, or swelling. Bimanually palpate the mandible, and examine for signs of crepitus or mobility. Place one hand on the anterior maxillary teeth and the other on the nasal bridge. 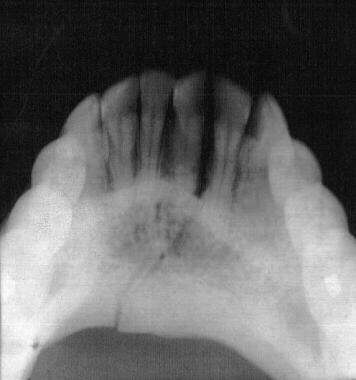 Movement of only the teeth indicates a Le Fort I fracture. Movement at the nasal bridge indicates a Le Fort II or III fracture. Manipulate each tooth individually for movement, pain, gingival and intraoral bleeding, tears, or crepitus. Perform a tongue blade test. Ask the patient to bite down hard on a tongue blade. If the jaw is fractured, the patient cannot do this and will experience pain. Palpate the entire length of the mandible and the temporomandibular joint for pain, deformity, or ecchymosis. Palpate the mandibular condyle by placing a finger in the external ear canal while the patient opens and closes the mouth. Pain or lack of movement of the condyle indicates fracture. Check for paresthesia or anesthesia of the facial nerves. Perform a thorough cranial nerve examination. See the images below. A passenger of a small automobile was not wearing a seatbelt and had a head-on collision with a tractor-trailer vehicle. The facial CT scan shows a combination of a Le Fort III and a mandibular fracture. 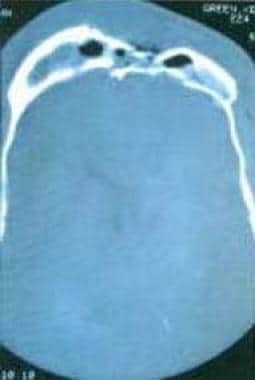 LeFort III fracture showing facial flattening, widening, and elongation. Courtesy of Arthur K. Adamo, DDS. Panfacial fracture. Courtesy of Arthur K. Adamo, DDS. The upper third of the face is comprised of the frontal bone and frontal sinus. The middle third of the face is comprised of the nasal, ethmoid, zygomatic, and maxillary bones. The mandible makes up the lower third of the face. It is subdivided into different areas, including the condyle, ramus, angle, body, symphysis, and alveolus. 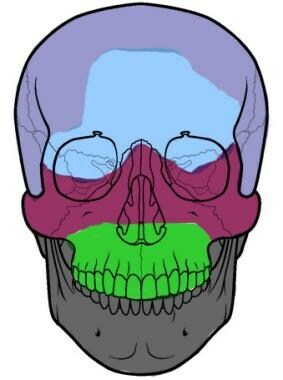 The frontal bone forms the superior orbital margin. The frontal process of the zygoma, the zygomatic process of the frontal bone, and the greater wing of the sphenoid form the lateral orbital margin. The zygoma and maxilla form the inferior orbital margin. The medial orbital margin is formed by the frontal process of the maxilla, lacrimal bone, the angular and orbital process of the frontal bone, and the ethmoid bone. The roof of the maxillary sinus forms the orbital floor. The orbital apex is formed by the lesser and greater wings of the sphenoid, palatine, and part of the ethmoid. The ophthalmic nerve is the first division of the trigeminal nerve. It is a sensory nerve supplying the skin of the forehead, the upper eyelid, and conjunctiva. Branches include lacrimal, supraorbital, supratrochlear, infratrochlear, external nasal, nasociliary, and frontal. The maxillary nerve is the second division of the trigeminal nerve. It also is a sensory nerve that supplies the skin on the posterior part of the side of the nose, lower eyelid, cheek, and upper lip. Branches include the anterior and posterior superior alveolar, infraorbital, zygomaticofacial, and zygomaticotemporal. The mandibular nerve is the third division of the trigeminal nerve. It is a sensory and motor nerve supplying the muscles of mastication and skin of the lower lip, chin, temporal region, and part of the auricle. Branches include the lingual, inferior alveolar, dental, mental, buccal, and auriculotemporal. The facial nerve supplies all of the muscles of facial expression. Branches include the temporal, zygomatic, buccal, mandibular, and cervical. The greater auricular nerve, a branch of the cervical plexus, supplies the angle of the mandible and skin over the parotid gland and mastoid process. The blood supply to the face is provided by branches from the the external and internal carotid arteries. Important branches are the lingual, facial, internal maxillary, and superficial temporal. Venous drainage is provided by the superficial temporal, pterygoid venous plexus, retromandibular, lingual, facial, and external jugular veins. They empty into a common trunk to the internal jugular vein. Do not manipulate facial bones unless cervical spine injury has been excluded. In one study, c-spine fracture was present in 2% of patients with maxillofacial trauma  . Avoid nasotracheal intubation with patients with upper face or upper midface fractures. Nasotracheal intubation can result in nasocranial intubation or severe nasal hemorrhage. Avoid blind clamping to prevent injuries to vital structures. Do not perform closed reduction of mandibular fractures by intermaxillary fixation on patients who are alcoholics, mentally retarded, or have a seizure disorder. These patients usually require an open reduction. Laboratory studies should be ordered based on the patient's medical history, current condition and planned surgical procedure. CT scan is the gold standard imaging technique to diagnose maxillofacial fractures. The sensitivity and negative predictive values of a routine nonenhanced head CT scan for fracture surveillance was found to be 100%  . 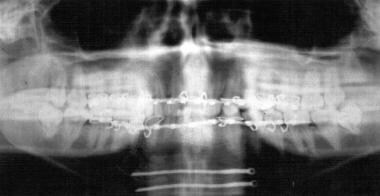 However, when the patient sustains a low impact injury to the mandible, a panoramic x-ray should be the initial screening imaging technique. General airway: Administer oxygen and maintain a patent airway. Maintain an immobilized cervical spine at all times until the spine is cleared. Clear the mouth of any foreign body or debris, and suction any blood present. Intubation: Intubate if indicated. Have the cricothyroidotomy and tracheotomy tray set up prior to an initial attempt at intubation. Consider conscious sedation intubation if distortions of the mandible and maxilla exist because a tight seal with the mask may not be possible when bagging. Consider nasotracheal intubation if massive oropharyngeal edema is present. Consider orotracheal intubation if midface or upper face trauma is present. 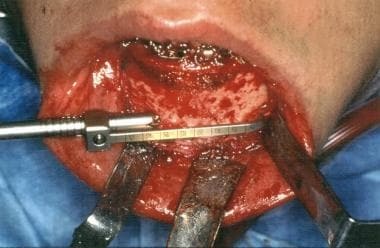 If unable to intubate the patient nasotracheally or endotracheally, cricothyroidotomy is the next procedure of choice. Breathing: Assess breath sounds. Check tube placement. Circulation: Do not remove impaled foreign bodies that can result in worsening of damage and bleeding. Control hemorrhage with direct pressure. Obtain large-bore intravenous access bilaterally. Disability: Assess the patient using the Glasgow coma scale (see the Glasgow Coma Scale calculator). Perform a brief neurologic examination. Note any change in mental status. Exposure: Expose patients, but keep them warm. Remove all clothing and accessories. Recover all avulsed hard and soft tissue, and transport them in damp gauze with no ice and very little manual manipulation. General medical therapy: Administer oxygen and isotonic crystalloid fluids. Administer packed red blood cells if indicated. Check the tetanus status of the patient and administer indicated. Antibiotics: Administer antibiotics for open fractures until the fractures are repaired and the soft tissue wounds are closed. Pain management: Use oral medications for minor injuries and parenteral medications if the patient cannot take oral medications (ie, nothing by mouth [NPO]). For anti-inflammatory control, use ibuprofen, naproxen, or ketorolac (Toradol). For central control, use narcotics (eg, codeine, oxycodone, hydrocodone, meperidine, morphine). The goals in the treatment of frontal sinus injuries are to provide an esthetic outcome, restore function, and prevent complications  . Nondisplaced anterior sinus wall fractures are treated by observation. 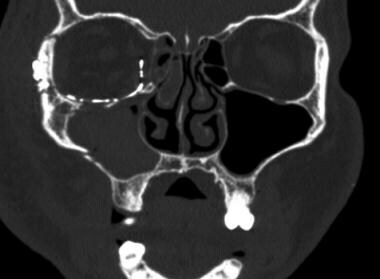 Displaced anterior sinus wall fractures require open surgical repair via a coronal approach or an endoscopic approach. The patency of the nasofrontal duct is of great concern in frontal sinus fractures. If this duct is distributed, obliteration is indicated to avoid late complications like mucocele and mucopyocele. In severe injuries that involve the posterior sinus wall with dural tears and cerebrospinal fluid leakage, cranialization might be requires with the assistance of a neurosurgeon. In this procedure, the posterior table is removed allowing the brain to expand into the frontal sinus  . Blowout fractures of the orbital floor require consultation with an ophthalmologist and maxillofacial trauma specialist. Several approaches are available including subciliary, subtarsal, transconjunctival, and transconjunctival with lateral canthotomy. The subciliary approach has the most complications (eg, ectropion) and the transconjunctival approach the least complications  . The indications and timing for fracture repair are debated; however, most literature supports a 2-week window for repair. The goal of surgery is simply to reconstruct the defect area of the fractured wall. As such, delaying the operation until the edema is resolved is feasible  . The indications for surgery on orbital floor fractures are controversial. Strong indications include enophthalmos greater than 2 mm, significant hypoglobus, or diplopia. Certain consensus also prevails regarding the need for surgery when there is an increase of orbital volume more than 1 cm3  . Orbital floor repair via subtarsal approach. Courtesy of Arthur K. Adamo, DDS. Nasal fractures should be managed between days 2-10. This allows time for resolution of the edema and therefore assists in obtaining the best reduction possible. After 10 days, achieving good closed reduction results may be difficult and it may be necessary to wait for as long as 6 months to obtain satisfactory good results via an open reduction technique. Successful management of NOE fractures demands consideration of both the hard and soft tissues. These fractures should be treated as soon as possible. Delayed repair is contraindicated especially in type III injuries, which involve the canthal ligaments. Once healing and scarring have begun, finding the avulsed medial canthal ligament becomes difficult, and the scarring may prevent adequate correction of the intercanthal distance, even with proper reduction of the bones  . Patients with isolated minimally displaced fractures to the zygomatic arch usually do not require treatment unless it caused a facial asymmetry. Marked displacement and/or impingement of the coronoid process of the mandible, preventing the patient from opening their mouth, requires admission and an open reduction via transoral (Keen) or temporal (Gillies) approach. In cases of a severe comminuted fracture an open reduction with internal fixation (ORIF) may be required. When the impact is sufficient to sustain a fracture of the ZMC consultation with an ophthalmologist is warranted to rule out ocular injury. Like the zygomatic arch fracture, surgical treatment of a ZMC fracture is indicated when a cosmetic deformity or functional loss is noted. Waiting 4-5 days for the edema to be reduced is helpful to properly assess the situation. A variety of techniques can be used to produce a satisfactory outcome  . The standard of care is open reduction and internal fixation with miniplates and screws. The orbital floor is frequently explored and repaired if necessary. Reduced ZMC fracture with orbital floor repair. Courtesy of Arthur K. Adamo, DDS. When the impact is severe enough to cause mobility of the maxilla or to a part of it, the patient should be placed in intermaxillary fixation and open reduction with internal fixation should be performed at the piriform rim and zygomaticomaxillary buttress. Patients with a maxillary fracture should be placed on sinus precautions. If the injury is associated with subcutaneous emphysema, antibiotics coverage is warranted to cover for the bacterial flora which could have been forced by the air into the subcutaneous planes. Maxillary fracture with rigid fixation at the piriform rim and zygomaticomaxillary buttress. Courtesy of Arthur K. Adamo, DDS. Temporary stabilization in the emergency department can be addressed with the application of a Barton bandage. Bring the teeth into occlusion and wrap the bandage around the crown of the head and jaw. This stabilizes the jaw and greatly reduces pain and hemorrhage. A symphysis or body fracture can be reduced temporarily with a bridal wire (a 24-gauge wire wrapped around 2 teeth on either side of the fracture). This greatly reduces hemorrhage, pain and infection. Non displaced mandibular fractures may be treated by closed reduction and intermaxillary fixation for 4-6 weeks. However, many patients do not tolerate closed reduction and prefer open reduction. Initially, the fracture is stabilized with intermaxillary fixation followed by open reduction and rigid fixation using titanium miniplates, mandibular plates, or reconstruction plates, depending on where the fracture is located  . Nondisplaced fractures of the condyle require intermaxillary fixation for 10 days, followed by physiotherapy to help restore improved function. Ankylosis of the joint is rare and is believed to be caused by an untreated intracapsular injury or fracture. Open reduction and internal fixation of the symphysis fracture with lag screws. Courtesy of Arthur K. Adamo, DDS. Postoperative Panorex view of the lag screw internal fixation. Courtesy of Arthur K. Adamo, DDS. 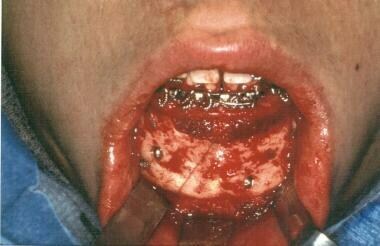 Bilateral fractured mandible treated by open reduction and internal fixation (ORIF). Courtesy of Arthur K. Adamo, DDS. At the time of surgery, tracheostomy or submandibular intubation is required. A submandibular intubation, which avoids a tracheostomy, is performed by first intubating orally, and then surgically bringing the tube out through the submandibular space. Nasoendotracheal intubation is definitely contraindicated. See the image below. 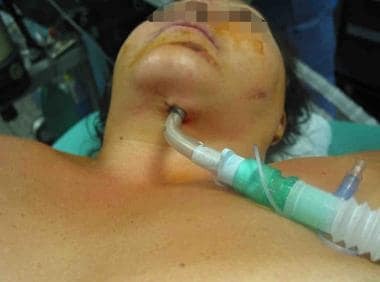 Submandibular intubation for pan facial fractures. Courtesy of Arthur K. Adamo, DDS. Facial bones are repositioned beginning at the cranium. After the occlusion is established by intermaxillary fixation, the remaining facial bones are repaired with open reduction and internal fixation. Open reduction and internal fixation of facial fractures results in a patient with a satisfactory facial appearance and restoration of their occlusion and function. High-impact facial fractures often are associated with other bodily injuries that may be life threatening. Low-impact fractures rarely result in mortality if proper treatment is administered. Extensive soft tissue injuries or avulsions and comminuted fractures are much more difficult to treat and may have poor outcomes. Severe hemorrhage from massive midface injuries may result in death. Airway obstruction, if not properly treated or detected, is associated with high mortality. The timing and indication for reconstruction of orbital floor fractures remain controversial. Open reduction versus closed reduction of mandibular condylar fractures and management of the nasofrontal duct in frontal sinus fractures are another areas of controversy. Nalliah RP, Allareddy V, Kim MK, Venugopalan SR, Gajendrareddy P, Allareddy V. Economics of facial fracture reductions in the United States over 12 months. Dent Traumatol. 2013 Apr. 29 (2):115-20. [Medline]. Manson PN, Hoopes JE, Su CT. Structural pillars of the facial skeleton: an approach to the management of Le Fort fractures. Plast Reconstr Surg. 1980 Jul. 66(1):54-62. Brandt KE1, Burruss GL, Hickerson WL, White CE, DeLozier JB 3rd. The management of mid-face fractures with intracranial injury. J Trauma. 1991 Jan. 31(1):15-9. [Medline]. C. Fowell, H. McQuillan, T. Martin. A peculiar orbital floor ‘blow-out’ fracture – or should that be ‘blow-in’ fracture?. ijoms. October 2015. Volume 44, Supplement 1:Page e210. Vincent B. Ziccardi, Hani Braidy. Management of Nasal Fractures. Oral maxillofacial surgery clinics of north america. May 2009. Volume 21, Issue 2:p203–208. Harry Papadopoulos, Nader K. Salib. Management of Naso-Orbital-Ethmoidal Fractures. Oral maxillofacial surgery clinics of north america. May 2009. Volume 21, Issue 2:p221–225. Edward Ellis III, Amir El-Attar, Khursheed Francis Moos. An Analysis of 2,067 cases of zygomatico-orbital fracture. Journal of Oral and Maxillofacial Surgery. June 1985. Vol. 43, Issue 6:417–428. Ellis E, Moos KF, el-Attar A. Ten years of mandibular fractures: an analysis of 2,137 cases. Oral Surg Oral Med Oral Pathol. 1985. 59:1:120–9. Mara˜o HF, Panzarini SR, Manrrique GR, et al. Importance of clinical examination in dentoalveolar trauma. J Craniofac Surg. 2012. 23:e404. Curtis W, Horswell BB. Panfacial fractures: an approach to management. Oral Maxillofac Surg Clin North Am. Nov 2013. 25(4):649-60. Choi M, Li Y, Shapiro SA, Havlik RJ, Flores RL. A 10-year review of frontal sinus fractures: clinical outcomes of conservative management of posterior table fractures. Plast Reconstr Surg. 2012 Aug. 130(2):399-406. Yew CC, Shaari R, Rahman SA, Alam MK. White-eyed blowout fracture: Diagnostic pitfalls and review of literature. Injury. 2015 Sep. 46(9):1856-9. Krishnan DG. Systematic assessment of the patient with facial trauma. Oral Maxillofac Surg Clin North Am. 2013 Nov. 25(4):537-44. Haug RH, Wible RT, Likavec MJ, Conforti PJ. Cervical spine fractures and maxillofacial trauma. J Oral Maxillofac Surg. 1991 Jul. 49(7):725-9. Lewandowski RJ, Rhodes CA, McCarroll K, Hefner L. Role of routine nonenhanced head computed tomography scan in excluding orbital, maxillary, or zygomatic fractures secondary to blunt head trauma. Emerg Radiol. 2004 Feb. 10(4):173-5. Bell RB. Management of frontal sinus fractures. Oral Maxillofac Surg Clin North Am. 2009 May. 21(2):227-42. Appling WD, Patrinely JR, Salzer TA. Transconjunctival approach vs subciliary skin-muscle flap approach for orbital fracture repair. Arch Otolaryngol Head Neck Surg. 1993 Sep. 119(9):1000-7. Kontio R, Lindqvist C. Management of orbital fractures. Oral Maxillofac Surg Clin North Am. 2009 May. 21(2):209-20. Ellis E 3rd, Kittidumkerng W. Analysis of treatment for isolated zygomaticomaxillary complex fractures. J Oral Maxillofac Surg. 1996 Apr. 54(4):386-400. Ellis E 3rd. Open reduction and internal fixation of combined angle and body/symphysis fractures of the mandible: how much fixation is enough?. J Oral Maxillofac Surg. 2013 Apr. 71(4):726-33. Al-Moraissi EA, Ellis E. Surgical management of anterior mandibular fractures: a systematic review and meta-analysis. J Oral Maxillofac Surg. 2014 Dec. 72 (12):2507.e1-11. [Medline]. Salgarelli AC, Bellini P, Landini B, Multinu A, Consolo U. A comparative study of different approaches in the treatment of orbital trauma: an experience based on 274 cases. Oral Maxillofac Surg. 2010 Mar. 14(1):23-7. [Medline]. Adamo AK, Pollick SA, Lauer SA, Sterman HR. Zygomatico-orbital fractures: historical perspective and current surgical management. J Craniomaxillofac Trauma. 1995. 1(2):26-31. [Medline]. Burnstine MA. Clinical recommendations for repair of orbital facial fractures. Curr Opin Ophthalmol. 2003 Oct. 14(5):236-40. [Medline]. Daffner RH. Imaging of facial trauma. Curr Probl Diagn Radiol. 1997 Jul-Aug. 26(4):153-84. [Medline]. Dale RA. Dentoalveolar trauma. Emerg Med Clin North Am. 2000 Aug. 18(3):521-38. [Medline]. Ellis E 3rd, Scott K. Assessment of patients with facial fractures. Emerg Med Clin North Am. 2000 Aug. 18(3):411-48, vi. [Medline]. Forrest CR. What's new in plastic and maxillofacial surgery. J Am Coll Surg. 2005 Mar. 200(3):399-408. [Medline]. Hatamleh MM, Watts DC. Mechanical properties and bonding of maxillofacial silicone elastomers. Dent Mater. 2010 Feb. 26(2):185-91. [Medline]. Laskin DM, Best AM. Current trends in the treatment of maxillofacial injuries in the United States. J Oral Maxillofac Surg. 2000 Feb. 58(2):207-15. [Medline]. Manson PN, Clark N, Robertson B, Crawley WA. Comprehensive management of pan-facial fractures. J Craniomaxillofac Trauma. 1995. 1(1):43-56. [Medline]. Morton D, Fridrich K, Aquilino SA, Fridrich TA. Interdisciplinary treatment of severe maxillofacial trauma: a clinical report. J Prosthet Dent. 2000 Aug. 84(2):133-5. [Medline]. Pedroletti F, Johnson BS, McCain JP. Endoscopic techniques in oral and maxillofacial surgery. Oral Maxillofac Surg Clin North Am. 2010 Feb. 22(1):169-82. [Medline]. Tuli T, Haechl O, Berger N, et al. 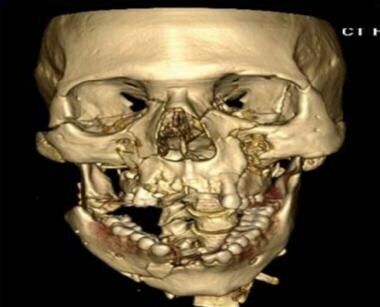 Facial trauma: how dangerous are skiing and snowboarding?. J Oral Maxillofac Surg. 2010 Feb. 68(2):293-9. [Medline].